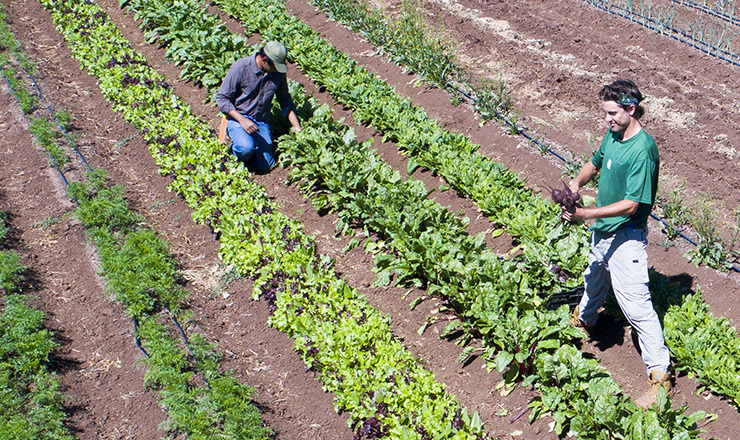 Apprentices harvest crops for CSA shares at the UCSC Farm. Welcome to the 2019 CSA Season! The UCSC Farm’s 2019 CSA Full Season is planned to run for 21 weeks, from Tuesday, June 4 through Tuesday, October 22 (if the start date is delayed by weather, the season will run later into the fall). Please note that we have shortened the season by one week (and dropped the price accordingly) to coincide with the apprenticeship schedule. There will also be a special Thanksgiving Share available for separate purchase in late fall. The Peak Season will run for 10 weeks, from Tuesday, August 20 through Tuesday, October 22. Full Season and Peak Season flower shares are also available, either as an add on to your CSA share, or as a stand-alone option. CSA share pick ups will take place every Tuesday at the UCSC Farm. To become a 2019 CSA Shareholder, please download and print the pledge form and follow the instructions. An Early Bird discount of 5% off the full share price applies if you sign up by May 1. A limited number of low-income shares are also available; please download and print the limited income pledge form and follow the instructions. Below you will find general information about our CSA effort. I LOVE the UCSC Farm CSA and tell everyone about it. It's been an overwhelming positive experience for me, and I will most definitely join next year. Thank you so much for all your efforts! Everything is always delicious and we appreciate all your hard work! Besides making me more adventurous in cooking/eating, the fruits and veggies truly tasted like homegrown organic. What a privilege! Each week staff and students produce the Field Notes newsletter, updating CSA members with information about the Farm, recipe suggestions, and more. Explore an archive of Field Notes from past seasons. Celebrating 24 Years of CSA in 2019! Staff and apprentices of the Center for Agroecology & Sustainable Food Systems manage a 30-acre farm and 3-acre garden on the UCSC campus. Each year, staff teach 39 students enrolled in the six-month Apprenticeship in Ecological Horticulture how to grow and care for a wide variety of vegetables, fruits, herbs, and flowers. In 1995 the staff and apprentices began a CSA pilot program with 16 shareholders. It was so successful that in 1996 the project expanded to 60 shares, and has since grown to 130 shareholders. Many of our shareholders are members of the UCSC campus community. The CSA project also serves as a model for students in our apprenticeship training course, many of whom go on to start their own CSA programs. The Community Supported Agriculture model is simple: the farmer sets a price for a share of the year's produce from his/her farm, then recruits a group of participants who purchase a membership in the farm and receive a weekly supply of fresh-picked produce. CSA members have the satisfaction of knowing where their food comes from and the farmer who grows it. The farmer has a guaranteed market in place - often before the growing season begins - coupled with up-front cash from member payments that can eliminate the need to borrow start-up capital. Farmers also benefit by developing a long-term community interest in the viability of their farm. Reconnecting people with the land and the farmers that support them is an important part of Community Supported Agriculture. The expression of the CSA model can take many forms. Shares are usually designed to feed two to four people at an average price of $10 - $30/week per share, and almost all CSA projects feature organically grown produce. Some farms don't require that shareholders commit to an entire season; instead, they may offer shares on a monthly or quarterly basis. CSA projects either have members pick up their shares at the farm or market garden, or deliver to centralized urban pick-up sites where shareholders drop by for their week's share. Although the make-up of shares fluctuates based on season and location, most CSA projects offer a mix of 8 to 12 types of vegetables, herbs, and fruits per week. Some CSA growers also buy or barter produce with other farms in order to diversify their own shares. In addition to seasonal produce, some CSA projects offer meat and dairy products, "value-added" products such as cheese and honey, and bread. Besides receiving a weekly share of produce, CSA members are often invited to take part in life on the farm through events such as workdays and potlucks. Many CSA farmers include a newsletter with the week's share, letting members know what's happening on the farm, what crops to expect in upcoming weeks, and offering recipe ideas. The CSA model has unlimited potential for connecting consumers directly to the source of their food, and for giving small-scale farmers and market gardeners a viable alternative to other marketing efforts. In the U.S., CSA projects first started on the east coast in the mid-1980s. The idea has spread quickly to the west coast, and today there are an estimated 30,000 to 50,000 consumers throughout the nation who rely on CSA arrangements for the majority of their produce.